Physical Geology students are required to understand the processes involved in plate tectonics. They are expected to know the geologic differences between continents and ocean basins and should be able to recall and use simple geologic terms to describe geologic processes and events. This activity is designed to improve student comprehension of the varied Earth materials and complex processes involved in plate collisions. 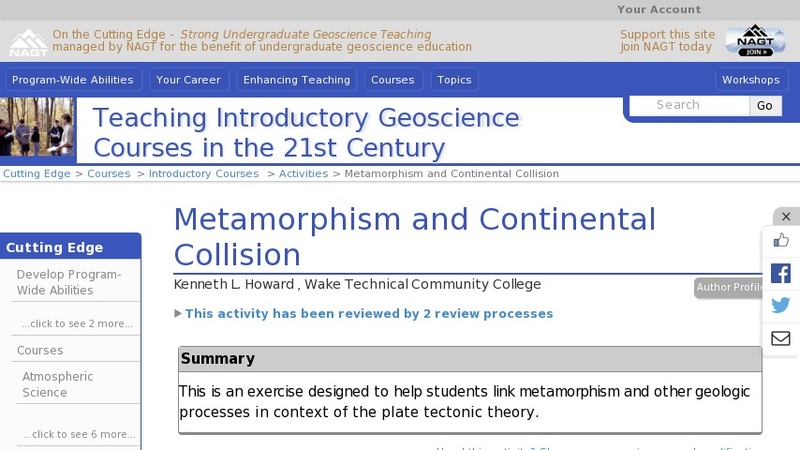 The activity synthesizes material covered during the first eight weeks of Physical Geology on plate tectonics, rock types, volcanoes, and Earth's composition. The instructor introduces the exercise to the students as a component of the college's Critical Thinking Initiative. The "hook" for the students is that the exercise represents a chance for self-appraisal of course content and understanding prior to the next semester test. The grading rubric for the lab is discussed with the students in terms of the Bloom Pyramid so that they can assess their level of progress in the course.